The pathway to personal growth embraced is at the center of the journey of your life. It awaits you consciously choosing it and implementing it in your own individual life. Achieve more harmonious peaceful and more stress-free mind balance – the paradoxes of life. What is, is. It does not have to be judged as “good” or “bad”. You will learn to experience much more in the here-and now. You will increase your emotional intelligence and pause with peace in situations that you may have been much more reactive to. 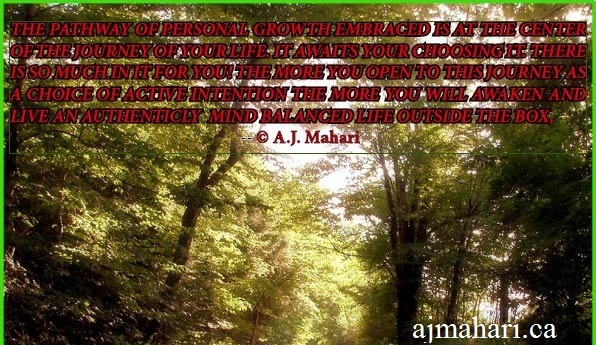 Embracing personal growth, what is in it for you? Why do people seek and invest time, energy, and resources to actively engage ongoing personal growth and development? Life is about many things. When it comes to each individual, however, at the core of each individual life there are circumstances, experiences, challenges, and choices. Embracing personal growth is one of those choices. The path is to seek, embrace, and have gratitude for every aspect of the full journey mindfully, unconditionally, and with radical acceptance. The choice is yours to begin today, continue today, or begin again today. The choice is yours to embrace the sum total of your life circumstances, experiences, challenges, and to make a clear choice to take the journey of deeper self-understanding. It is from this deeper self-understanding that your understanding of others and, in fact, so much else in the world and in life will also be awakened and be a much more consciously intentional. This is the pathway to successful mind balance, and to finding out more about what is in it for you on this journey of personal growth. What is in it for each and every individual is a matter of great importance for humanity as a collective whole. We are all inter-related. We are here together. Begin by being who you really and fully are or finding out more about that “you”. Know that each step you take on this journey of embracing personal growth will awaken awareness, compassion, empathy, and understanding of so much to do with self, others, and the sea of humanity. The sea of humanity, struggling though it may be, each individual is an equally unique and important raindrop. To grow is an on-going life-long journey. It requires of each individual time and effort. If you aren’t consistently working to make yourself emotionally stronger and smarter, then you’re may become stagnant – personally, professionally, and spiritually. This is not a path to more awareness, happiness or to the mind balance outside the box that will bring so much more meaning to who you really are. So many write and talk about personal growth and development. Some people feel as though or believe that once they reach their adulthood or a certain age that they have arrived at a destination. Life is not about arriving at any such destination. Life is an ever-unfolding journey, whether we awaken to it or not. So what’s really in it for you to invest time and energy and be open to a mindset of embracing personal growth? Learn more about yourself. When you tap into your potential, the knowledge and awareness you gain will help you live a more meaningful, awake, and aware life. Radically Accept the person you are as you are right now. Know that you’re doing everything you can to increase your personal awareness. You have chosen a journey of Personal Growth and Development. Accept those parts of you that are less than perfect – know more each day and you will do a little better each day. You’ll appreciate yourself more when you mindfully observe how your awareness of your own potential expands as you embrace this journey . Recognize how much effort you make when the going gets tough. Patting yourself on the back is okay after fighting through a challenge. You deserve some kudos. Working through the tougher challenges makes the overall journey that much more enlightening and rewarding. Feel exhilaration. It’s refreshing to spend more time focusing on your inner self – really getting to truly know you better in a mind balanced way – rather than the outer others and how you may think they think about you. Yes, it’s nice to surround yourself with a few choice items of personal preference, but knowing that you’re busy discovering or re-discovering more of your inner self is invigorating. Increased confidence. When you’re consistently engaged in a plan of self-development, embracing on-going personal growth, you begin to better recognize your many talents and abilities. To really actively identify and seek to meet your goals. Assimilate things you hadn’t considered before. This journey of embracing personal growth will increase your awareness, compassion, empathy, and ability to truly feel connected to yourself, to others, and to humanity and the world at large. Maybe you’ve decided to take dance lessons to step out of your comfort zone. Expanding your inner-wisdom, interpersonal skills and deepening your insights is a great adventure. Bolster your inner strength. Feeling positive about your efforts to evolve gives you strength. And the stronger you feel inside, the more invigorated your life and daily experiences will be. It also helps you, as you embrace personal growth, to increase your self-awareness, self-esteem, and self-worth. Embracing personal growth is a great way to create the change that you want and need in your life so that you can be, from the inside out, a free individual, and pursue your goals, dreams, and passion. This adds incredible meaning to life. This will give you mind balance no matter what is going on inside at any given time or what is going on in our world – a world that is complicated hectic, and that still is so beautiful in so many ways.